Croal and Barker would place games on a pedestal. 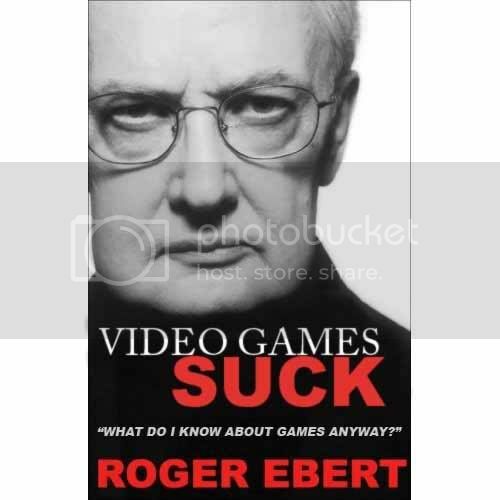 Ebert, it seems, would shove them off. But to what end? The worst part: I almost watched that last night. A game is art if its developers (the ones with any creative input, that is) approach it as artists. Where's the incentive to make your game that way, though? This is a debate that will rage until everyone who didn't grow up with a PlayStation in the house is dead. In the meantime, wake me if somebody comes up with a definition of "art" that satisfies everyone. It was impressive to see how Ebert's point-by-point short rebuttals were, in fact, extremely superficial, and often nothing more than red herrings, totally missing the whole point. It's actually disapointing, from such a critic. He simply doesn't even care about making a detailed and well thought article, and too rapidly dismisses video games. He also misses the point that it was about what games *could be*, not what they *are*. Finally, he doesn't even really try to respect his oponent, and some of his "arguments" really come as crass. You can grab his latest book! That said, if I had to develop games, I'd worry about being sure that the game fits with both my wishes regarding content and experience, and the necessary results to have my business thrive and provide enough ressources to create even more games. The art debate would be a very side-topic issue to me, mostly irrelevant. This is a remarkably dumb little editorial. Basically it says, artistic games may never make money so why are we talking about whether there will be artistic games; let's just see what happens. Yet at the same time he admits Shadow of the Colossus was art and made money, which would seem to undercut his own premise. If there are artistic games making money then it seems perfectly reasonable to talk about the future of games as an artistic medium. The author also completely ignores the possibility of non-commercial art, even though there are games that fall into that category (Bad Milk comes to mind). A lot of the most notable achievements in film art were not feature-length movies but shorts like Meshes of the Afternoon and Un Chien Andalou. What if there had been the same attitude towards discussion of art in film? What if the French had never thought to consider film noir as art or had not thought enough about the possibilities of film to create the New Wave movement? What if Ingmar Bergman had decided not to try to be an artist because there wasn't much profit in it (I believe he was often underwritten by the government precisely because there was no money in it; if video games are acknowledged as an artistic medium they could get government funding, at least in other countries that have more respect for art than the U.S. This article is just foolish.